Franchises are often either a hit or a miss. Investing in a franchise is only a good idea if you’re aware of the risks. Costs might run high and some franchise locations may not succeed, which is a risk that the franchisee must be willing to take. While any business proposition is risky, statistically, franchises have been the safest investments to make. Here at New York Bagel Café and Deli, we have a proven business model that is ready for expansion. Since our genesis nearly 15 years ago, founder Joe Smith has brought together a delightfully affordable and tasteful menu together under one roof. That’s why New York Bagel Café and Deli was marked as one of the best food franchises to start up, along with popular names like Rita’s, Saladworks, Little Caesar’s, Mrs. Fields, and the Smoothie Factory. We have a trusted brand with a name that people like, and over the years, have become loyal too. Yelp.com, one of the most trusted and reputed food networks available boasts the reputable qualities of this establishment from satisfied customers just like you. We are proud to host a strong majority of positive reviews and customer feedback: customers have cited our “extremely friendly staff”, our fantastic prices and broad menu, some fans, like Denise D. of Jersey City was satisfied to the point where she and her boyfriend consider NY Bagel Café and Deli as “totally a staple for us”. Across the nation, we are recognized for having the traditional New York taste and for making bagels exactly as they “are supposed to be made; Hard and crisp on the outside, soft and chewy inside. 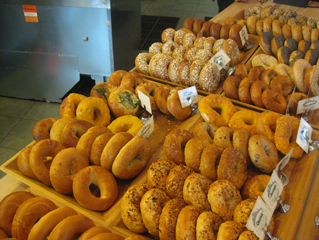 I’m from NYC and these bagels would make NY proud!” claims Pamela E. (Tennessee). Satisfied customers like these are why we stand by our name. We are in the process of expanding, and are now looking for new franchise owners who are dedicated and ready to pour their heart and soul into this foundation. NY Bagel and Café is not just your ordinary bagel place; it’s a place to meet new people, to relax and enjoy a warm meal that satisfies both the wallet and the stomach. Come on down to your nearest NY Bagel Café and make the choice for yourself!